Out of all the Greek dishes, youvetsi is the one to bring up the most heart-warming memories of Sunday lunch. Family around the table chattering, glasses clinking and rich tomato sauce. You have been visiting my youvetsi recipe a lot, so I thought I would give you a sea-side version for it. Once you prepare the sea food, this dish is made in a chiffy. Unlike the traditional youvetsi that requires baking, you can do it all in the pan. 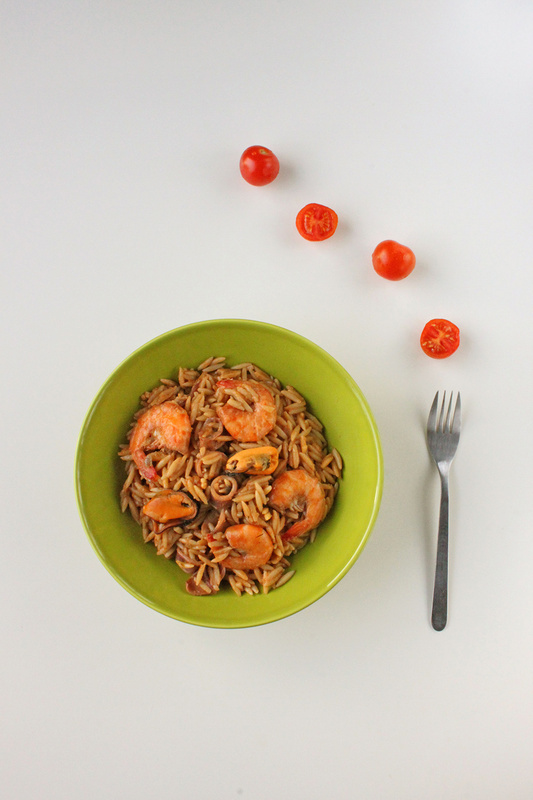 This youvetsi brings seafood in the spotlight and you can add or remove seafood to your liking. You will probably be tempted to get a bag of frozen mix sea-food for this, resist tempation if possible. You can find some tips below for preparing the seafood yourself, or ask your fishmonger to do the squid. The key to success for this youvetsi is, of course, super fresh ingredients and a homemade prawn stock. Mussels, rinse under cold water and scrub them to get rid any barnacles. To debeard your mussels, hold the mussel with one hand and pull towards the hinge firmly. Do keep the legs, by cutting just under the eyes. Once cut, push out the bic with your fingers. If you haven’t done this before, watch this little video from the Sydney Fish market, it’s most helpful. First remove the heads, gently twisting and pulling away from the body. To shell them, peel off half the way down. Then shake the tail to ease it off the body. Gently easy the vein off the body, it’s the prawn’s intestinal tract and if left on you get this gritty unsavoury taste. Keep the heads for the stock! Finely chop the onion and fry in a large pot for a couple of minutes. Add in the prawns, cook for another couple of minutes and put off with cognac. Add in the water, thyme, oregano and peppercorns. Bring to the boil, then lower the heat and simmer for 30 minutes with a half lid on the pot. The broth should condense to half. Seafood needs very little time in the pan, so be careful to not overcook. In a large frying pan, saute one shallot and a clove of garlic with a drizzle of olive oil then add your cleaned mussels to steam. 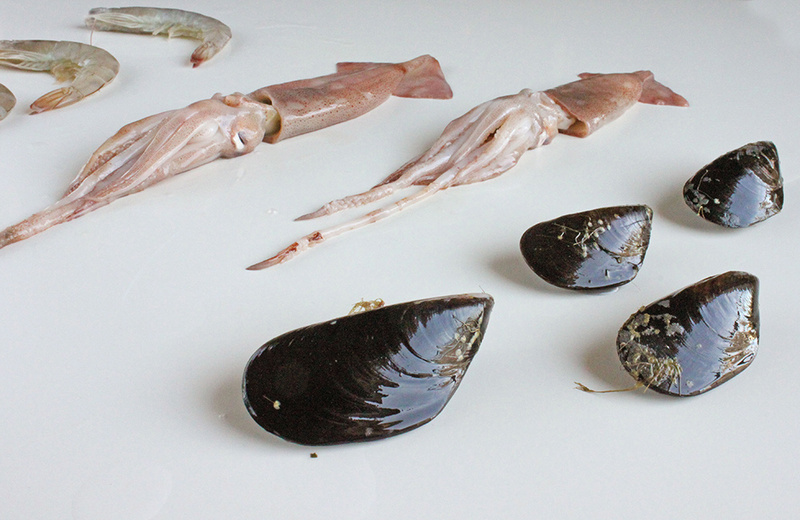 Any mussels that remained closed after steaming should be discarded. Let them cool a bit and remove them from their shells. Put in the cleaned prawns and cut squid. These will only need 1-2 minutes in high heat, until they change colour. Remove all seafood from your pan. 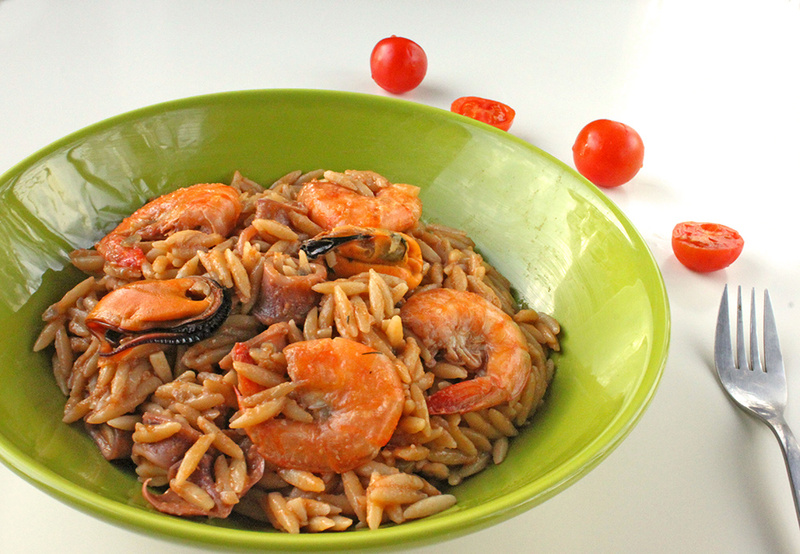 In the same pan, add in the orzo pasta, grated tomato, tomate paste and stir to combine. Slowly add in your stock. Bring to the boil and keep stirring, it will need about 20 minutes for the orzo to soften. A couple of minutes before it’s ready add in all your seafood, mussels, prawns and squid and chopped parsley. Looks good. Loved the video on cleaning the squid–she makes it look so easy. With lots of practice I am sure it is. I usually stay away form seafood since iodine does not agree with me. But looks good just the same. She really does, doesn’t she? I’m not that much of an expert – it will take quite a bit of practice! iodine mhhh, it is a strange one. Keep well and talk soon! This is one awesome recipe (or 2 for that matter)!! Prawn stock for the win! I will never EVER throw away prawn heads again -tsk tsk tsk, what have I been thinking?? Oh yes, homemade prawn stock is doing half of the job for the tastiness of this dish! Nice instructions also of how to clean and prepare the various seafood! instructions make all the difference – I was once truly fearful of squid cleaning, no more though!